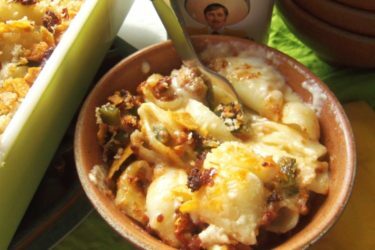 The cheesy goodness of queso fundido is hard to beat. It’s one of those dishes that you can adapt with whatever veggies and meats you have available. My favorite style includes mostly grilled ingredients. This reduces the oils involved, since it’s easy to “overdo” cheese just a bit, which causes it to separate. Also, you’ll have a wonderful balance of strong flavors to go with the cheese. 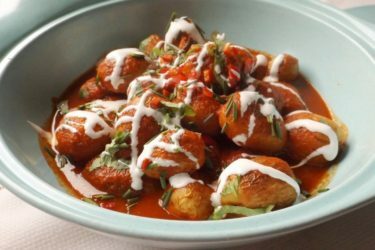 I leave chorizo out of this recipe because it contributes grease, even after cooking. But feel free to add it; just cook it first. Grilled chicken strips are going to serve as our side for this recipe. 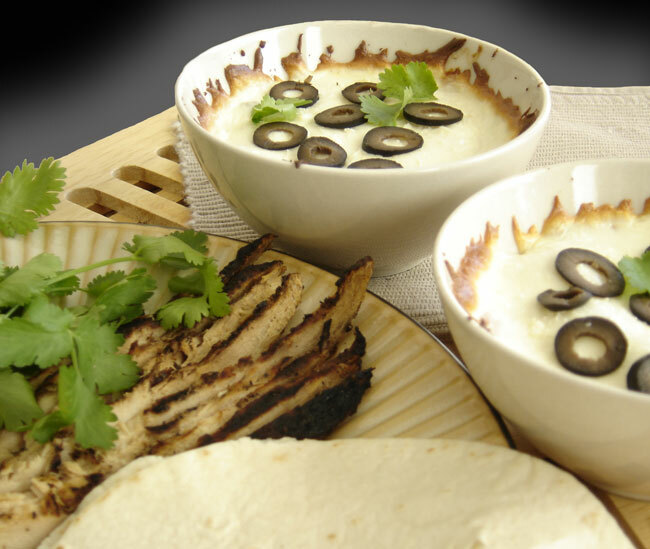 A frequent misconception for queso fundido is that it’s a dip for chips. That’s not really the case, as this is one queso version that tends to set up quickly. The creamy goodness of asadero is a cheese of choice. Use Monterey jack as a substitute, but it will be stringier. Just as it comes out of the oven, you want it ready to serve right down the middle of warm flour or corn tortillas. Then, layer with your sides and enjoy! 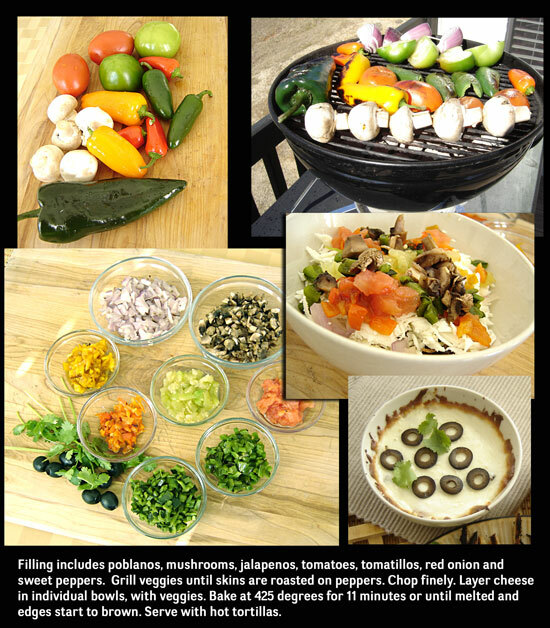 Our laundry list of grilled veggies includes fresh mushrooms, tomatillos, Roma tomatoes, red onions, poblanos and jalapenos. Black olives and cilantro will be the toppers. It sounds like a lot of ingredients – yes, it’s loaded and ever so good. You don’t necessarily want a fundido to be overly “cheesy.” It’s all about balance. 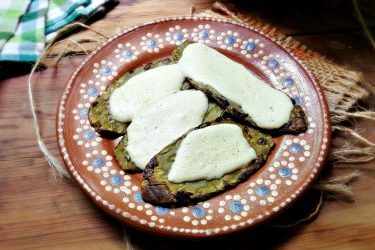 The melting cheese (asadero) will be shredded and layered with the ingredients. Since this is a soft white cheese, it helps to freeze, not quite hard, beforehand. It’s much more friendly with the grater that way. Baked in individual oven-safe bowls, it’s easy for each guest to serve themselves. Use a large spoon and it will scoop out easily. Just have decorative cloths handy as grippers for the hot sides. Do keep an eye on the oven process; when the cheese is melted, that’s it. Any more and you’ll see what I mean about separating. For individual bowls, place a layer of cheese in the bottom, a layer of veggies, another layer of cheese, more veggies, then cover the top with cheese. For a larger casserole dish, place a single layer of cheese in the bottom, spread the veggies, then top with cheese. Place in preheated 425-degree oven for about 11 minutes. When tops are completely melted, remove and serve immediately with warmed tortillas and chicken strips. Add tortilla chips if you wish. If the cheese begins to cool, scoop onto a heated tortilla and microwave for 20 seconds. It’s still delicious! Oven-safe bowls can be microwaved, too. You can build this dish ahead of time and refrigerate. Just bring to room temperature and bake.